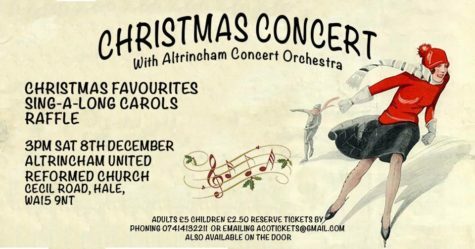 Come along to a lovely charity Christmas concert hosted by the fabulous Altrincham Concert Orchestra and you’ll be supporting vital childhood cancer research. The event will take place on Saturday 8th December at 3pm at the Altrincham United Reformed Church. You’ll be entertained with a host of Christmas favourites as well as sing-a-long carols, refreshments and a fantastic raffle. Tickets are £5 for Adults and £2.50 for children. Simply call 07414 132211 or email acotickets@gmail.com. A number of tickets will also be available on the door. A huge thank you once again to the Altrincham Concert Orchestra for your ongoing support of Friends of Rosie. You make a real difference to the children’s cancer research projects we fund.